Ireland team manager Paul McNaughton predicts the chase for world ranking points will make Argentina more formidable than ever. The Pumas are desperate to retain fourth place in the International Rugby Board Rankings to ensure they enter the World Cup draw among the top four seeds. Fifth-placed England, who have Tests against South Africa and New Zealand remaining this month, could yet overhaul them in time for the draw on December 1. Victory over Ireland would strengthen Argentina's position and McNaughton knows the stakes at Croke Park will fire-up the Pumas. "Argentina don't usually need any other incentive to beat Ireland - they have beaten us before when there's been nothing on the line," he said. "But they still have a chance of retaining that fourth spot in the rankings and that gives them something more to play for. "That would put them in the top tier if other results went the right way for them, so they certainly have something to fight for." 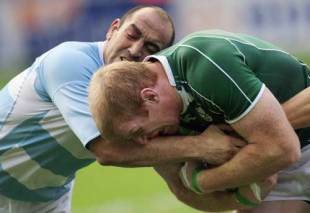 Ireland have their own agenda against the Pumas - one that has major ramifications for their progress through to the 2011 World Cup. They must beat Argentina to retain eighth place in the rankings and ensure they are not drawn alongside two top-tier nations on the pool stages. Scars still remain from their last World Cup group campaign, which was hamstrung from the moment they were picked alongside hosts France and the irrepressible Pumas. Their demise was ultimately sealed by Argentina, who have won the last three encounters in a ferocious rivalry spanning just 18 years. Locked at five wins apiece in their last 10 meetings, Ireland head coach Declan Kidney knows Ireland must pull out all the stops if they are to beat a team placed higher in the rankings for the first time since toppling Australia in 2006. "We have a huge game on Saturday when we'll try to stay in the top eight," he said. "It's in our hands because we can beat a team ranked above us. We haven't done that in a while. "Argentina just have that ability to soak up a lot of pressure and they play with a great work ethic. "This month they played against France in Marseille, which is an extremely difficult place to go, and lost just 12-6. It could have gone in their favour. They looked even stronger in beating Italy last weekend because they put in a few more defensive nuances into the game. "That put the Italians under that bit more pressure. Giving them another week under their belt means they will be even stronger now."